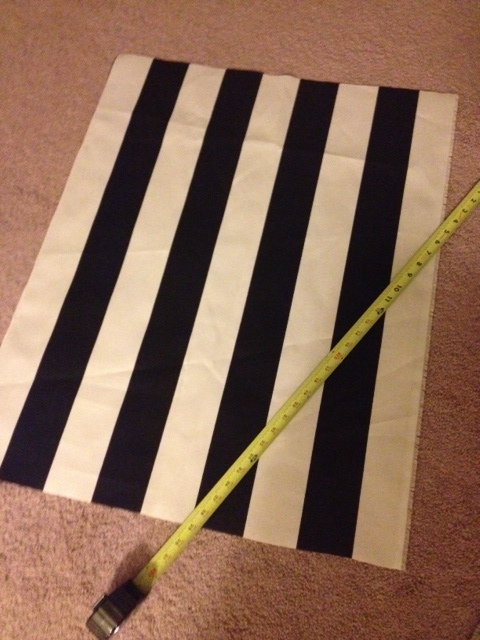 Indoor/Outdoor Decorator Fabric in “Vertical Stripe Ebony” – purchased on sale at $8.00/yard, left over from my side-light window panels. Iron-On Hem – Available at your local craft store, Walmart etc. Step 1: I began by measuring out my fabric to the correct length and width (allowing for an extra 2 inches on top, bottom and sides for creating my fold-over hem) and cutting it accordingly. Step 2: I then used iron-on hem to fold over the edges (top or bottom first doesn’t matter) and create your hem. 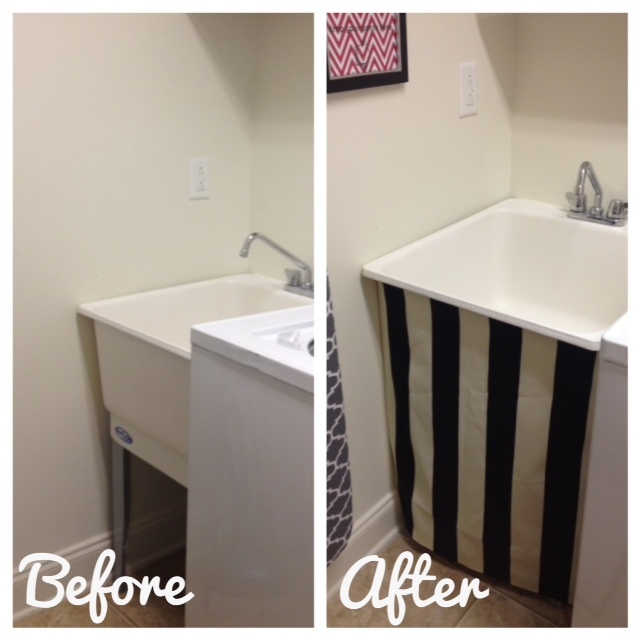 Check out my DIY No-Sew Curtain Panels to read more about this process, just disregard the instructions for creating the panel pocket. 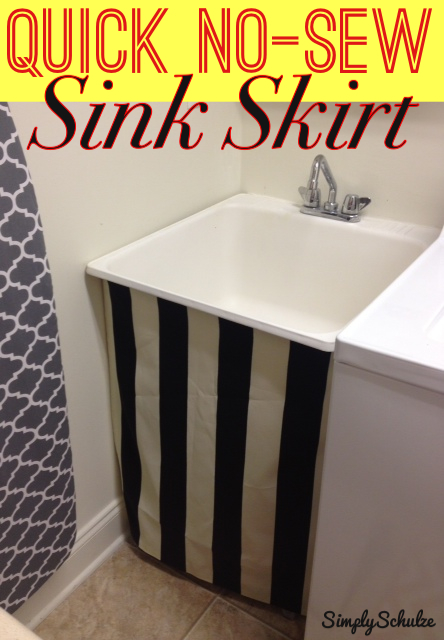 NOTE: If you plan to suspend the sink skirt using a tension rod, follow the previously mentioned tutorial exactly, pocket included. Step 3: Once all of my hems were made I removed the sticky backing to one side of each my Command strips and used hot glue to secure it to the top, inner edge of the fabric panel. Next I adhered the other two Command strips to the top edge of sink, right below the lip using just the regular sticky backing of the strip (these things are super strong, they’ll hold no problem). FYI, this is just to show placement, the sticky side will be down and velcro side will be facing up. I removed the paper from the strip, then put my hot glue directly onto the sticky part and firmly pushed the strip onto the hem.